Thought this was worth sharing. From our buddy Del Albright. Also keep an eye out for some more East Coast news involving Del. 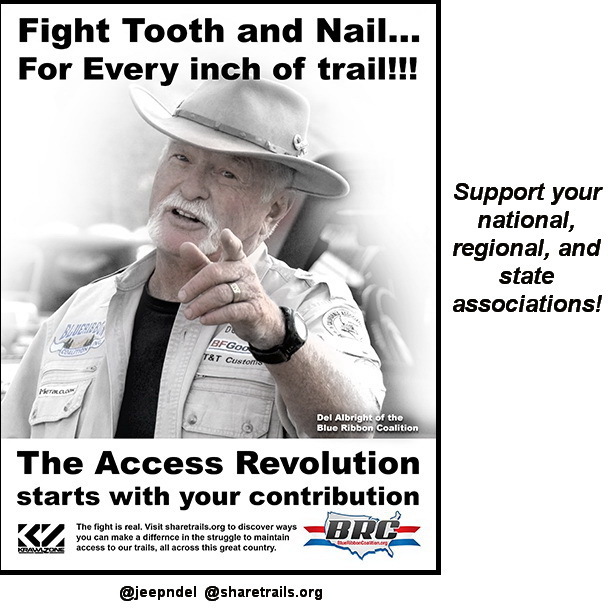 “Fight Tooth and Nail” tells the tale for me and a lot of other folks in the land use, off-road, backcountry world. Kurt Schneider, Land Use Editor for CRAWL Magazine won a caption contest hosted by Krawlzone TV with this cool saying and it is worth sharing and passing around. KrawlzoneTV (http://www.krawlzone.tv/) is fully on our land use team and I hope you’ll pay them a visit and support their work as well. I’m a full time Sharetrails/BRC guy, but I also fully and completely support my State Association. I hope you will do the same with this – encourage folks to join and support everything they can afford to, starting with national and regional group along with State and local clubs/associations. The more the merrier.